Gen J SAT Gear 2016 pack! Here are some of the key things you need to take part in a Generation Joshua Student Action Teams! 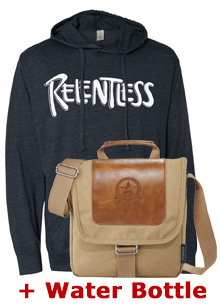 We have a limited production run of our 2016 Relentless themed hoodie, a brand new Field satchel with Generation Joshua branding, and a water bottle. All essential gear for any successful political deployment. We have only ordered a limited run and will not be reordering, so don't delay. For those of you who are wondering, yes this is the same material and style as the iGovern 2016 Fearless hoodies! From Emily H. of Paducah, Kentucky on 10/17/2016 . 9/16/2016 – Is there a way we can get just the satchel?